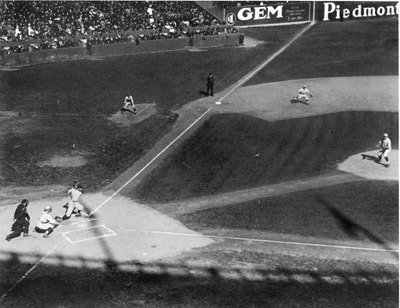 In the 1921 World Series, the New York Giants beat the New York Yankees five games to three. 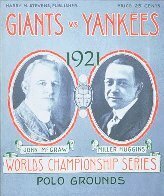 The Series was much-anticipated, as it featured John McGraw's Giants, who were dedicated practitioners of the dead-ball era's "inside game"; and the Yankees, who relied on the "power game" exemplified by their star player, Babe Ruth, who was coming off a sensational year, arguably his best ever statistically. Injuries suffered during the Series would limit his effectiveness significantly. However, this Series marks the start of the Yankees dynasty, as it was the first of 40 American League pennants as of the 2009 season. Despite Ruth's limited action, the Series was a closely-contested matchup. The Series ended on a double play featuring a baserunning miscue. Because of an infected arm and a bad knee (he wrenched it in the fifth game), Babe Ruth did not start the final game but did appear in the bottom of the ninth pinch hitting for Wally Pipp. For the first time in World Series play, all games were held at one site: the Polo Grounds in New York, with the home team alternating. The Yankees sub-leased the Polo Grounds from the New York Giants from 1913 through 1922. The Series was the first to be broadcast on radio. Announcer Thomas Cowan recreated the game over Westinghouse-owned WJZ in Newark, listening to phoned-in reports from the stadium. Following the Series, Ruth and Bob Meusel participated in some post-season barnstorming, which was then against the rules for Series participants. Both were suspended for the start of the 1922 season, but Ruth made a personal appeal to Commissioner Landis. He upheld their suspensions, but agreed to rescind the rule effective with the end of the 1922 season. If the 1920 season had left Boston wondering if they had made a mistake, then the 1921 season surely removed any doubt. Babe Ruth was in New York and busy breaking his own records for the second consecutive season. As the Red Sox were struggling to stay competitive, the Yankees were still getting used to winning after coming off of a third place American League finish during the Babe's "rookie" season in a pinstriped uniform. Nothing changed in 1921 as their new acquisition raised his homerun record to a staggering fifty-nine, his RBI total to one-hundred seventy-one and his batting average to .378 on the way to their first American League pennant and World Series appearance. The Babe wasn't alone though as teammate Bob Meusel contributed twenty-four homers and one-hundred thirty-five RBIs and the rest of the Yankees batted .288 or higher. Two other "ex-Red Sox", Carl Mays (a twenty-seven game winner) and Waite Hoyt (with nineteen) added insult to injury while Bob Shawkey added eighteen more victories. The National League's Giants were veterans to the Fall Classic and had plenty to smile about themselves. With a line-up of lumberjacks including Frankie Frisch, Ross Youngs, George Kelly and Irish Meusel and a solid pitching staff known as the "fearsome foursome" (Art Nehf, Fred Toney, Jesse Barnes and Phil Douglas), they promised to give Babe Ruth and his re-born Yankees a run for their money. In the first World Series to be played entirely in one ballpark (the Polo Grounds), the Big Apple's "rival roommates" squared off in the first official Subway Series. Despite rumors of Ruth on the mound, Miller Huggins gave the Game 1 start to Carl Mays while John McGraw selected Phil Douglas. The Yankee's pitchers quickly set the tone for the Series with an opening 3-0 victory that was repeated the following day with a two hit, 3-0 triumph by Waite Hoyt. Down but not out, the Giants managed to come back in Game 3 after trailing four runs in the fourth. After tying it up in the bottom the inning, McGraw's team rallied for eight runs in the seventh thanks to Ross Youngs' bases-loaded triple. In the end, the Yankees had blinked and were taken for twenty hits and a 13-5 victory that turned the momentum back to the veterans. The Giants continued as Douglas returned the following day and vindicated himself with a 4-2 win that tied the Series at two games apiece. Game 5 was even more dramatic as an injured Babe Ruth shocked everyone with a key bunt in the fourth inning, setting up the winning run off a Bob Meusel double. The Yankees had regained their composure and walked away with a 3-1, Series leading victory, but at a terrible cost as their most valuable player would be unable to continue due to arm and knee ailments. Despite the absence of the Babe, the Yankees still felt confident with their remaining line-up. That was until they lost Game 6, 8-5 and Game 7, 2-1. Great performances at the plate by Irish Meusel and Frank Snyder as well as a solid outing on the mound by Phil Douglas had put the Giants out in front. Game 8 evolved into a classic pitcher's duel between Waite Hoyt and Art Nehf, who led the standoff 1-0 going into the bottom of the ninth. In a last chance effort, the desperate Yankee skipper went to his bench and replaced the struggling Wally Pipp (who had batted a miserable .154) with the still injured Babe Ruth who grounded out to first. Two plays later, the Series was over with the Giants winning five games to three. Although they had fallen short in their first World Series appearance, the Yankees had shown a glimpse of what would become a dynasty. Waite Hoyt had not allowed a single earned run in twenty-seven innings and Carl Mays had been just as effective with an ERA of 1.73 over twenty-six. Ruth batted an impressive .313 and added his first World Series home run and four RBIs. After four straight losses, the Giants had finally reclaimed the championship title for the first time since 1905.